Championship side Hull shocked Premier League high-flyers Leicester City on penalties to move into the quarter-finals of the League Cup. Midfielder David Meyler struck the winning fifth penalty as the Tigers scored all their efforts, with Riyad Mahrez hitting the post for the Foxes. After 90 goalless minutes, Mahrez put Leicester ahead in extra-time, tapping in after Jamie Vardy's shot was saved. 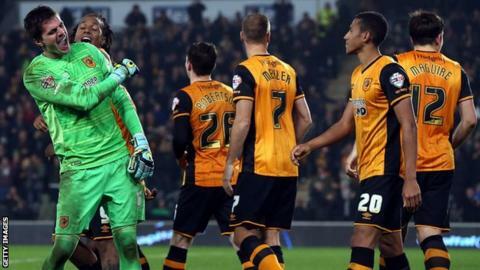 Abel Hernandez levelled for Hull on 106 minutes, taking the game to a shootout. Leicester have made a superb start to the season but manager Claudio Ranieri made 10 changes, signifying his priorities lie away from the League Cup. And the Foxes were second best in the first half as Greg Luer had a goalbound shot blocked by Ritchie de Laet and Shaun Maloney's acrobatic effort hit the side netting. The match went into an extra 30 minutes and Leicester broke the deadlock through Algerian Mahrez, but were pegged back by Hernandez's effort. Hull goalkeeper Eldin Jakupovic was the hero in the shootout, denying Mahrez as Hull progressed to the last eight of the competition for the first time in their history. "It was important to use all our players tonight. In the end we lost to one penalty so well done to Hull City. "Of course I'm not pleased with the result, but the performance was good. We wanted to go through, but it was one mistake." "We made eight changes and beat a Premier League team, which was terrific. "There were some decisions that I have to say were erratic. Maybe that's best put like that and I'll keep it at that. "I would get into trouble if I tell you my real thoughts. "But some of the decisions we had go against us I just thought were awful, if I am being honest, but there you go." Match ends, Hull City 1(5), Leicester City 1(4). Penalty Shootout ends, Hull City 1(5), Leicester City 1(4). Goal! Hull City 1(5), Leicester City 1(4). David Meyler (Hull City) converts the penalty with a right footed shot to the bottom left corner. Goal! Hull City 1(4), Leicester City 1(4). Jamie Vardy (Leicester City) converts the penalty with a right footed shot to the top left corner. Goal! Hull City 1(4), Leicester City 1(3). Chuba Akpom (Hull City) converts the penalty with a right footed shot to the centre of the goal. Goal! Hull City 1(3), Leicester City 1(3). Marcin Wasilewski (Leicester City) converts the penalty with a right footed shot to the bottom right corner. Goal! Hull City 1(3), Leicester City 1(2). Tom Huddlestone (Hull City) converts the penalty with a right footed shot to the high centre of the goal. Goal! Hull City 1(2), Leicester City 1(2). Gökhan Inler (Leicester City) converts the penalty with a right footed shot to the top right corner. Goal! Hull City 1(2), Leicester City 1(1). Shaun Maloney (Hull City) converts the penalty with a right footed shot to the bottom right corner. Goal! Hull City 1(1), Leicester City 1(1). Daniel Drinkwater (Leicester City) converts the penalty with a right footed shot to the centre of the goal. Goal! Hull City 1(1), Leicester City 1. Abel Hernández (Hull City) converts the penalty with a left footed shot to the bottom left corner. Penalty saved! Riyad Mahrez (Leicester City) fails to capitalise on this great opportunity, left footed shot saved in the bottom right corner. Penalty Shootout begins Hull City 1, Leicester City 1. Second Half Extra Time ends, Hull City 1, Leicester City 1. Attempt saved. Moses Odubajo (Hull City) left footed shot from outside the box is saved in the centre of the goal. Assisted by Isaac Hayden. Attempt blocked. Tom Huddlestone (Hull City) left footed shot from outside the box is blocked. Assisted by Abel Hernández. Attempt saved. Chuba Akpom (Hull City) right footed shot from outside the box is saved in the bottom right corner. Assisted by Abel Hernández. Corner, Leicester City. Conceded by Tom Huddlestone. Attempt saved. Isaac Hayden (Hull City) right footed shot from outside the box is saved in the centre of the goal. Assisted by Shaun Maloney. Second Half Extra Time begins Hull City 1, Leicester City 1. First Half Extra Time ends, Hull City 1, Leicester City 1. Attempt missed. Marc Albrighton (Leicester City) right footed shot from outside the box is close, but misses to the right. Assisted by Daniel Drinkwater. Goal! Hull City 1, Leicester City 1. Abel Hernández (Hull City) right footed shot from very close range to the centre of the goal. Attempt saved. Chuba Akpom (Hull City) right footed shot from the left side of the box is saved in the centre of the goal. Assisted by Isaac Hayden with a through ball. Attempt missed. Abel Hernández (Hull City) left footed shot from more than 35 yards misses to the right. Goal! Hull City 0, Leicester City 1. Riyad Mahrez (Leicester City) left footed shot from the centre of the box to the bottom right corner following a fast break. Attempt saved. Jamie Vardy (Leicester City) right footed shot from the left side of the box is saved in the centre of the goal. Assisted by Daniel Drinkwater with a through ball. Attempt blocked. Abel Hernández (Hull City) header from very close range is blocked. Assisted by Shaun Maloney with a cross. Corner, Hull City. Conceded by Ritchie de Laet.